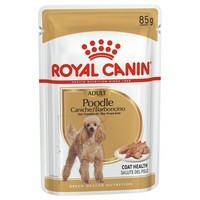 Royal Canin Poodle Adult Wet Food Pouches have been carefully formulated to provide optimum support for adult and mature Poodles over 10 months old. Made with high quality ingredients including essential vitamins and minerals, the food targets the areas usually missed with normal food and ensures your dog has everything they need to live a long and happy lifestyle. Coat Health: Contains nutrients which help maintain health of the Poodle’s woolly coat.